Philips has created a solid-sounding, compact and robust Bluetooth speaker that's perfect for almost al occasions. It almost feels like portable Bluetooth speakers are the new essential product category for consumer gadget makers. Every second day a new portable, weatherproof Bluetooth speaker seems to apparate from nothing onto our desks, waiting to be reviewed. Philips is not exempt from this desire to join the portable music trend. While Philips has a long history in speakers – including its decent lineup of Fidelio Bluetooth units – the BT6000 is the latest compact portable Bluetooth speaker from partner Gibson Innovations. At AU$179.95 (£89.95, approx US$130), the price tag falls in line with products like the Bose SoundLink Color, but significantly more than the cheapest options on the market. That's not necessarily a bad thing though, as its solid build quality and commendable sound output make it a true contender. 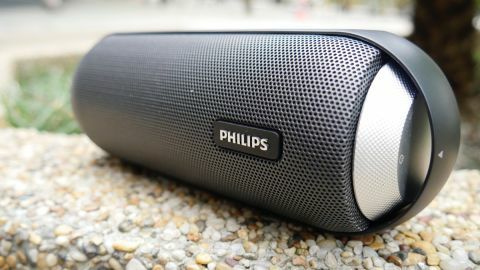 While the name of products like the UE Roll and the Bose Soundlink Color give you some idea of the product's design, the Philips BT6000 does no such thing. With a cylindrical 360 degree speaker design wrapped in a black, flat hard plastic case, the BT6000 can conveniently rest either vertically on the base or horizontally on the frame. Interface is truly kept to a minimum here. There's a pairing button on the frame, while the power and volume is controlled by an old-school dial on the top, reminiscent of old analogue radio tuners. There's also a clearly marked NFC logo, which allows you to pair Android phones quickly and easily. As always, iPhone users are going to have to connect the old fashioned way. Measuring in at 19cm long and about 7cm in diameter, the BT6000's grill looks like it has the potential for fragility, but holding the 500 gram speaker in your hand you can feel that it's as robust as you need it to be. The bottom of the speaker has an audio input and the micro USB charging port, covered by a thick rubber flap that is obviously designed to keep water out. The BT6000 is weatherproof, apparently, so that little design decision makes sense. Unless you want to plug in an auxiliary input in a wet environment, that is, in which case you're all out of luck. Philips says that there's a 4400mAh battery inside this thing, which is good for eight hours of battery life. There's no handle on this little speaker per se, but the design of the frame means there is a loop that could allow it to be tied on to almost anything. It's a pretty narrow gap though, so if you were hoping to throw a carabiner or something similar through the gap, you might struggle to get it to fit. Let's be honest: This little speaker is capable of making you the most obnoxious jerk on the train, should you decide to pair it to your phone and regale your fellow passengers with your favourite Apple Music playlist. But if you decide to use it for good, this little speaker has quite a bit of grunt. If you turn that little volume dial around a full 360 degrees, you'll get a full blast of whatever tunes you select, without any sort of distortion (but with that incredible sense of vibrating air if you hold your hand above it close enough). Inside there's two pairs of drivers and passive radiators making the sound, with an output of 12W. Admittedly, playing Spotify at a low volume doesn't offer the fullest sound – there's an emphasis on the mid range, with bass weaker at lower volumes. Twist that dial up a bit and things balance out significantly. It's still a touch weak on that bass front, but given the size of the speaker that's hardly a big surprise. The high range is decent enough without being spectacular. But the most impressive thing is that things don't distort regardless of the volume, something many similar-sized speakers are incapable of doing. While the audio output probably doesn't match the quality of the Bose or even the UE Mini Boom, it's certainly decent enough to warrant a second look. Pairing your device to the speaker is easy, either through the included NFC chip or via the old fashioned manual pairing process. Because Philips has opted for a minimal user interface here, there's no pressing multiple buttons to pair the speaker the old fashioned way either. Charging via the micro-USB port underneath the waterproof flap on the bottom of the speaker is as easy as you'd expect it to be. You can also plug in an external source using a standard 3.5mm audio cable, which might be a useful backup if things get desperate, but probably not something you'll use very often, if at all. The mini Bluetooth speaker market is already a pretty crowded marketplace, so Philips has definitely got its work cut out for it despite the company's pedigree in audio. The good news is the speaker is definitely worth checking out. While it's not the best sound we've ever heard from a speaker this size, you do get a decent range for such a compact product. And the speaker packs a decent punch, with plenty of volume without fear of distortion. A simple interface with next to no buttons and the old-school radio dial volume control are welcome, although it does mean you'll have to pull out your phone to quickly stop the tunes (or turn the volume down). Build quality is superb and robust, which you'd expect at this price. The only real issue we could find was the auxiliary port – there's no bundled cable, and the fact it's tucked away behind a rubber seal means you open the device to risk if you use an auxiliary input in a wet environment. But on the whole, this little speaker is a convenient, lightweight companion for your music.